October 2017 marks the 20th anniversary of MAST at STScI. From a small initial staff working off of the HST archive, MAST has continued to grow, evolve, and optimize as the demands of astronomical data advance. This mission continues today with the goal of best serving our users and community. A bit more than twenty years ago, NASA began to set up archive and research support centers at various locations including HEASARC at GSFC in 1990 and IRSA at IPAC in the mid-90’s. NASA’s vision was to support long-term storage and use of NASA data, and to provide the community with access to scientists and analysts with some expertise in the data and processing systems. Scientists working in the STScI Data Management Systems proposed to NASA that an archive be established to host data from a variety of missions, which would build upon the well-established archive for Hubble Space Telescope (HST) data. As a result of that proposal, the Multi-mission Archive at Space Telescope (MAST) was founded. In October of 1997, work began on adding data from legacy missions to this new archive, starting with data from the International Ultraviolet Explorer (IUE) and the 1978 Copernicus mission. Initially, the group dedicated to this task was comprised of only four staff members (Myron Smith, Catherine Imhoff, Randy Thompson, and Karen Levay). The Far Ultraviolet Spectroscopic Explorer (FUSE) in 1999 and Galaxy Evolution Explorer (GALEX) in 2003 were the first two new missions to use MAST as their primary data archive and distribution platform. Data from Kepler, K2, and many others have followed since then. In April 2012, the MAST archive was renamed in honor of former Maryland Senator Barbara A. Mikulski. First elected to the House of Representatives in 1976, Senator Mikulski is both the longest-serving female member of the U.S. Congress and the longest-serving female senator (1986-2017). She has long been a strong and effective supporter of space science and of the missions hosted within the Mikulski Archive for Space Telescopes. MAST staff with Sen. Barbara A. Mikulski. Today, MAST is the home to 15 legacy and 5 active missions or projects spread across approximately 3 petabytes of file storage. 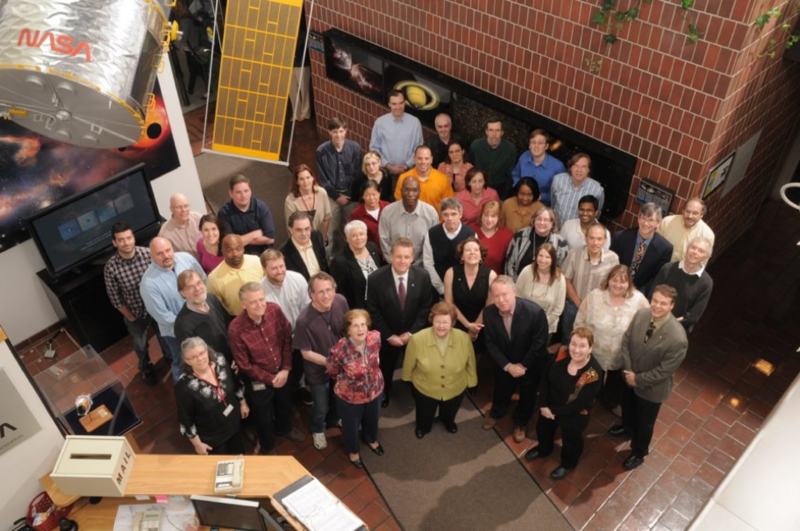 MAST staff actively collaborate with other NASA archives in addition to international institutions, with longtime partners at the Canadian Astronomy Data Centre, European Space Astronomy Centre, and participate in the International Virtual Observatory Alliance. MAST also hosts more than 120 High-Level Science Products contributed from across the astronomical community, including multi-wavelength ground- and space-based observational data, theoretical models, and computational simulations. In addition, MAST will be the data archive for the upcoming Transiting Exoplanet Survey Satellite (TESS) and the James Webb Space Telescope (JWST) missions. As STScI looks toward the future, MAST will be a part of the team working with the newly-established STScI Data Science Mission Office (DSMO) to maximize the scientific returns from the MAST archive. The DSMO and MAST staff are working to continually optimize the Institute's ability to help the scientific community address the challenges of accessing and working with increasingly large and complex astronomical observations. This task takes a great amount of effort from both engineers and astronomers alike, and we thank you all for your continued support! Recent software updates will provide HST PI's with automatic data authorization, as well as the ability to authorize other users. Beginning with the Hubble Space Telescope (HST) Cycle 25 proposals, PI's will automatically be authorized to access data from their programs in the MAST archive. It will no longer be necessary to email the archive help desk to ask for authorization. In addition, another recent software enhancement gives PI's the ability to authorize others to access proprietary data from their programs. This is done from the MyST account page. 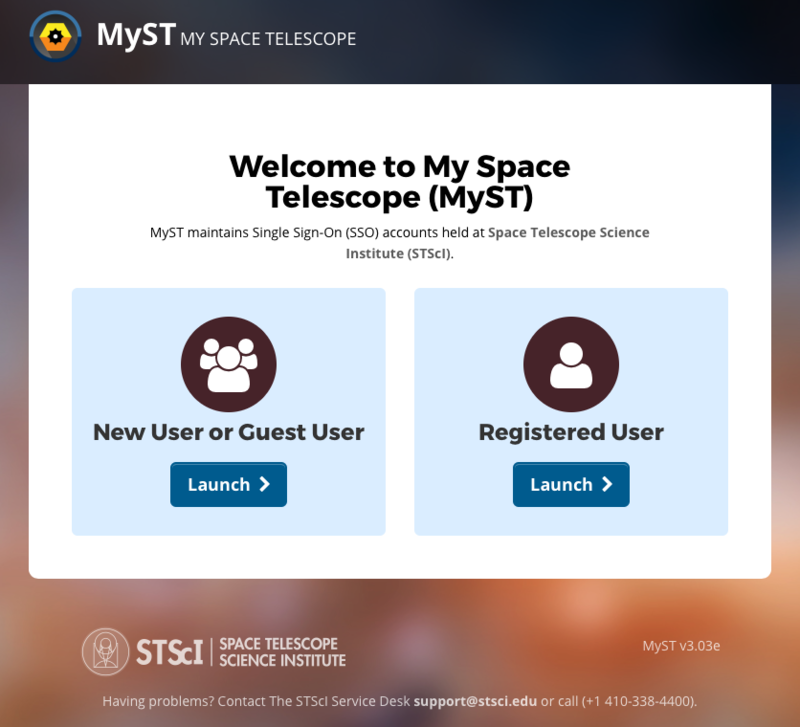 Once logged in, the PI can select their program from the 'Manage Access to Proprietary Science Data' dropdown menu, then search for and add any other user with a registered MyST account. Please contact the archive help desk with any questions or comments on these updates. MAST holdings are now available through an IVOA standard TAP service allowing table data access through queries in ADQL. We are happy to announce that MAST holdings are now available via an International Virtual Observatory Alliance (IVOA) standard Table Access Protocol (TAP) web service. Metadata for searches are defined in the Common Archive Observation Model (CAOM) and include the Observation Data Model Core Components (ObsCoreDM). The MAST TAP service for CAOM and ObsCoreDM creates new and powerful ways for researchers to query MAST data holdings and cross-correlate it with their own data and data of other VO-enabled archives. The Table Access Protocol API is an IVOA standard, with astronomical data centers worldwide providing data that is searchable through their own services with the same interface. These services, which can accept geometry-based queries in the SQL-like ADQL language, are supported by software clients such as TOPCAT to visually build and manipulate tabular query results. The MAST CAOM TAP service is registered in the IVOA network of metadata registries for automated VO client discovery. Python-based programmatic access to TAP-enabled data is also possible through extensions to astropy packages such as Astroquery and PyVO. A help page with documentation for TAP, its use and sample queries, the underlying standards, and information on the tables we provide is provided with the service website. Some features of the service are undergoing continual development and additional catalogs including PanSTARRS and the Hubble Source Catalog are planned to be made available through TAP interfaces at MAST; stay tuned for more! Further questions can be directed to archive@stsci.edu. New HLSPs available through MAST include K2 light curves with asteroseismology parameters, characterization of stars in the TESS southern Continuous Viewing Zone, and simulated deep fields for HST, JWST, and WFIRST. The month of September had three new High Level Science Products (HLSPs) released at MAST. HLSPs are community-contributed data products that relate in some way to a MAST-hosted mission, which may include models and simulations, mission data processed in a unique way, or follow-up data from other telescopes. Figure 1: Example power spectrum from K2GAP. 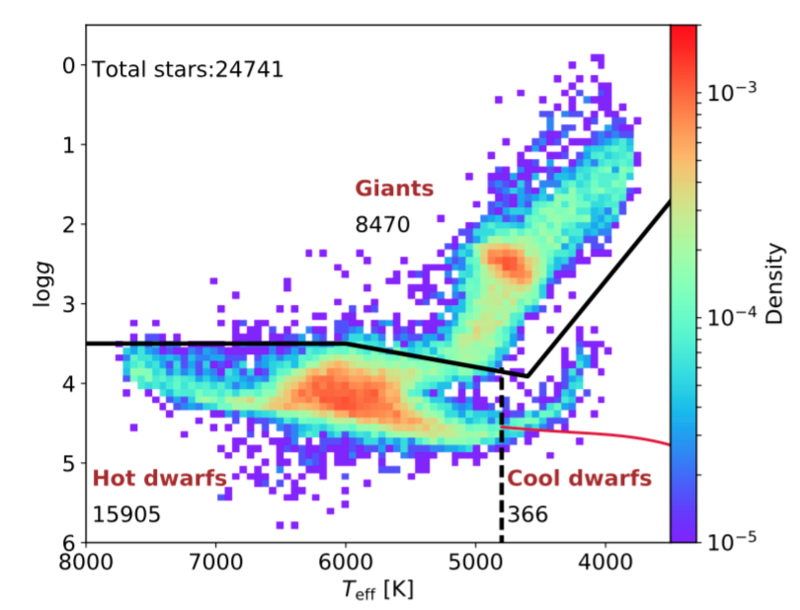 The K2 Galactic Archaeology Program (K2GAP; Stello et al. 2017) is a catalog of asteroseismic parameters (dnu and numax) for red giants in K2 Campaign 1 from six different pipelines. 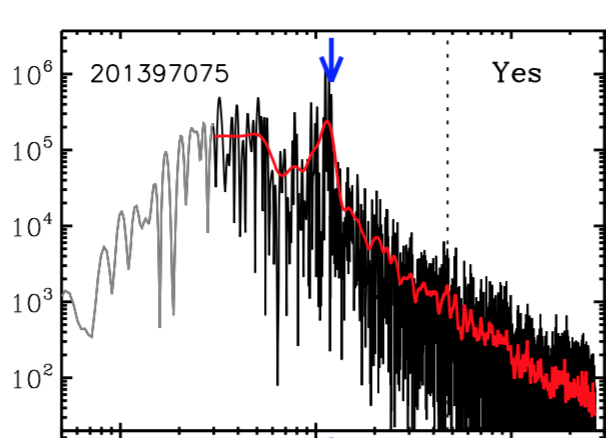 The team has released their version of the detrended K2 light curves, the catalog of asteroseismic parameters, and the power spectra for 1200 red giants. Figure 2: Distribution of T_eff and log(g) for TESS-HERMES targets. TESS-HERMES (Sharma et al. 2017) is a catalog of spectroscopic stellar parameters for ~16,000 dwarf and subgiant stars in the southern Continuous Viewing Zone of TESS. Stellar properties are derived following a Bayesian approach, based on spectral analysis and theoretical isochrones. The results include effective temperatures, surface gravities, [Fe/H], rotational velocities, distances, ages, masses, and radii for the stellar population. The catalog of values is available on MAST for download and in MAST CasJobs for SQL access. 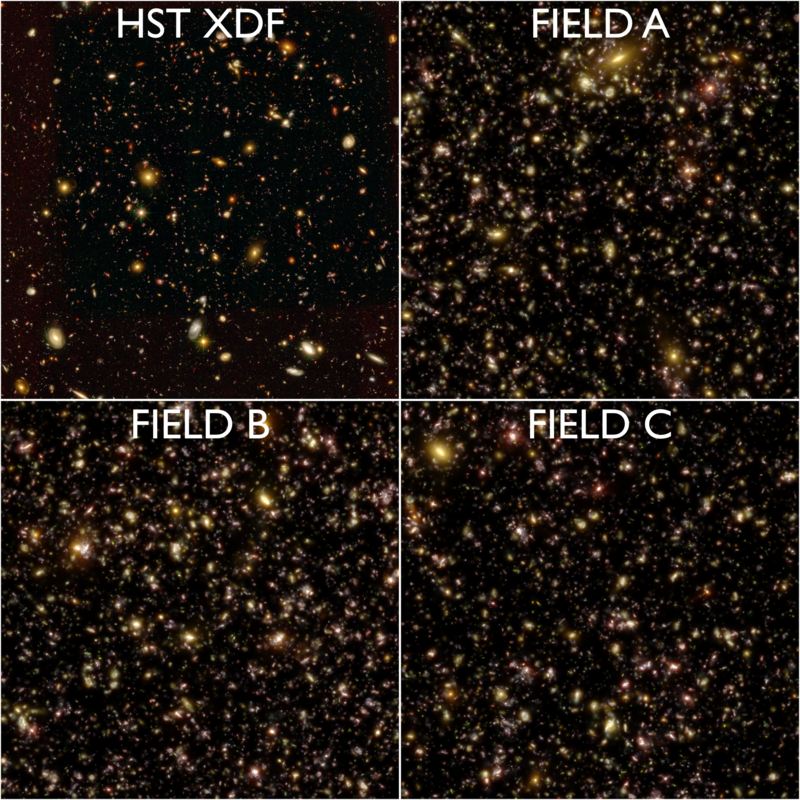 Figure 3: Example simulated deep fields from Illustris. Illustris (Snyder et al. 2017) is a set of simulated deep fields based on the Illustris Project’s cosmological simulations of galaxy formation. Three fields, each 2.8 arcminutes across, are provided in common filters used by HST, JWST and WFIRST. Images are provided both with and without PSF convolution, and the simulated source catalogs from which each image is generated are also provided. Additionally, a Github repository is available with software, tutorials, and more documentation. Questions about these or other high-level science products can be sent to archive@stsci.edu. Interested in submitting your own HLSP to MAST? Read more about the process here and contact us to discuss development.